A waning winter means more and brighter light. I guess all artists have their favorite painting spots. I have a few. This is one of them. It is located in a whole area west of VT Rt. 7A in Shaftsbury that is a favorite. This particular road actually has two names – it’s Coulter Road from this view point. Further along in this direction, it changes names to Tinkham Road. 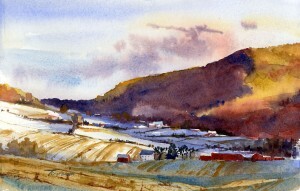 The series of connected red barns in the lower left of this painting have appeared in a number of my plein air paintings. On this particular morning, the bright late winter sun was lighting up the east side of the hill while leaving the sharp dropoff to the west in deep shade. The hill itself cast a bright blue shadow over the fields which had just been dusted with new snow overnight. The fields farther to the left were actually catching some of the early sunshine. The contrast betwen the light and shadow was too much to pass up! “In The Shadow of the Hill” is approx. 7″ x 11″ and is matted and mounted to 11″ x 14″ for easy, low-cost framing.